With the loss of many of our habituated individuals, we had long hoped that this year’s pups would help replenish our population so that the study could continue. Unfortunately, we lost seven individuals in rapid succession. Baine, one of our best individuals for conducting experiments on, disappeared with his two pups. Cylon and his three pups (already well habituated and starting to forage independently) disappeared as well. We lost all signal from their collars and searched endlessly on this reserve and the surrounding farms. We were left with one habituated fox and very little hope of finding new individuals soon. This disheartening news led to the decision that we were going to have to shut down fieldwork at this location. As responsible field biologists, We (Steph and Matt) had to take off Barbie’s radio collar before we left. How would we be able to do this? Luring foxes into the large cage-traps had never really worked. When we put the collars on, we had the help of vets and large nets… but Barbie has always been quite skittish, so we had to come up with another idea. Earlier on, when Cylon had a paw caught in his collar, we successfully used a noose to catch him so we decided to give it a try on Barbie. Because of her reluctance to get close to us, we prepared ourselves for a number of unsuccessful attempts at capturing her. We went out there, armed with a noose, a net, a little patience, and a lot of anticipation. We crept close to her in the red dune area south of the riverbed, lured her in with an abundance of raisins, humming softly to her. Slowly, but surely, she inched her way towards us. The tricky part, you see, isn’t getting her to come close to us, but to get her head into the noose without touching those big, characteristic ears. If you do, they jolt away from you and you have to retry hoping they don’t run too far away from you. This is exactly what happened…twice, but with perseverance and a bit of luck, she put her head through the noose while reaching for a raisin. We tightened the rope and rushed in to pin her down. 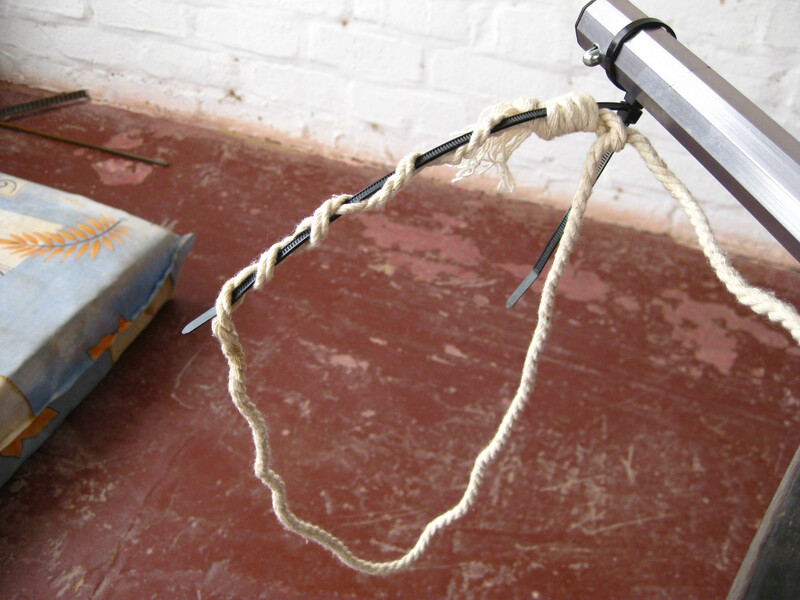 This is for her and our own safety as she could easily bite us or get entangled in the rope. We quickly undid the screw that was holding the collar on tightly and removed the leather straps. The rope was released and she ran free. She turned around about ten meters and looked at us indignantly. We didn’t mind though, she was free to go live her life and hopefully raise some pups in the future. With any luck, by the time we start fieldwork again, she will have forgiven us and not forgotten the whistle call. What’s next? While the foxes are running through the sands of the Kalahari, everyone will be sitting in front of their computer screen analyzing the data from the last two years and spreading the word on these charismatic batties. We will try not to dwell too much on what we’ve lost. 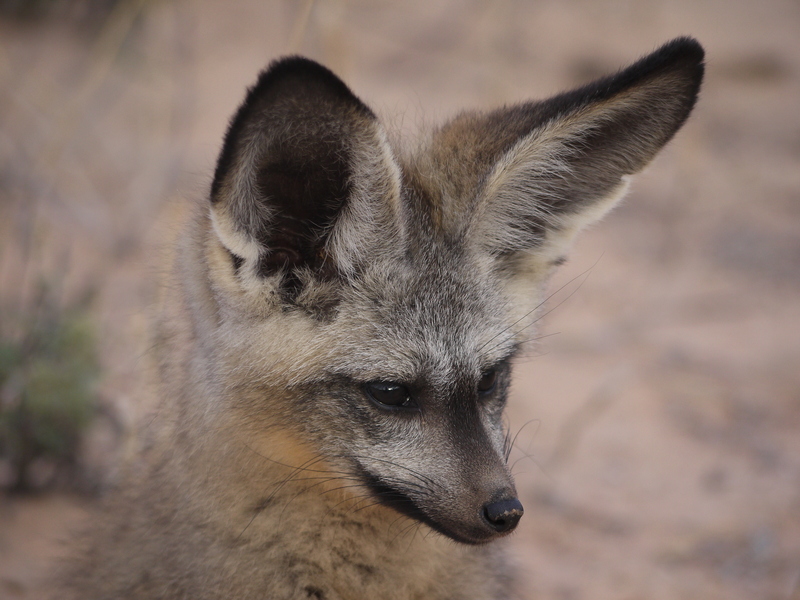 This entry was posted in bat-eared foxes, field work, foxes, habituation, Kalahari and tagged capture on June 3, 2016 by Steph. A bright torchlight is a must-have for a bat-eared fox field biologist. With a bright torchlight one can easily identify the owner of a suspicious pair of eyes (particularly, owners with dagger sharp horns) and avoid walking into the grasping branches of thorny acacia thickets. Most importantly, a torchlight helps when following a battie during a nocturnal follow. Information collected during follows give us an idea about batties’ diet, territory usage, and social interactions with other foxes. I can keep the spotlight on my focal fox as it dashes up the side of a sand dune or through a maze of driedoring bushes. Occasionally, a fox decides to takeoff like Superman, and it is very challenging to keep up with them when I am only allowed to follow at a “non-threatening” speed-walk. Mostly, my torch helps me to feel safe – it makes the night almost familiar to me, and is a constant reminder of how visually-centered we are, as human beings. There is no way my other senses would compensate for the absence of my torch at night. 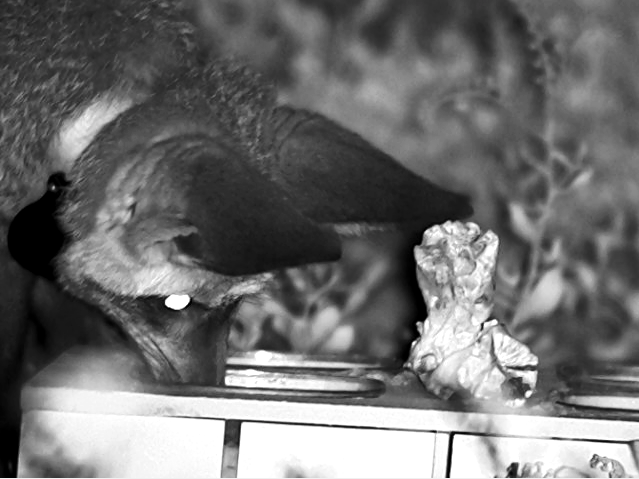 From the beam of my torchlight I have observed foxes locate insects by integrating information from multiple senses. 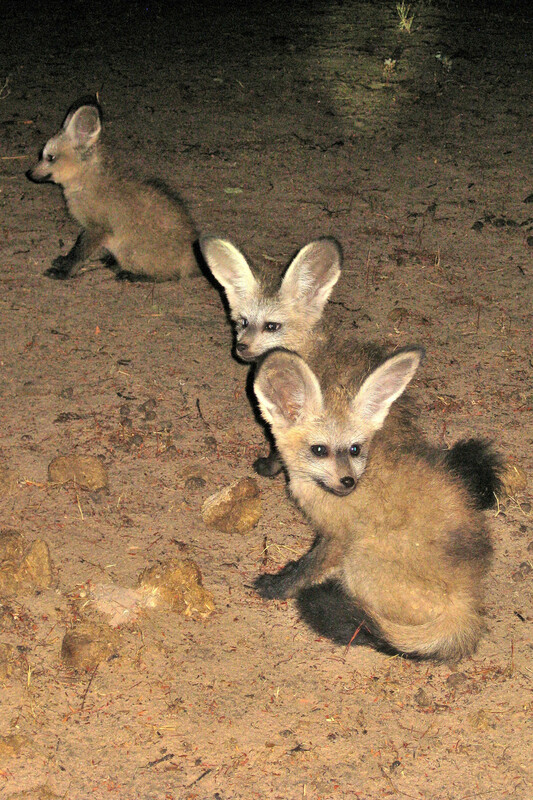 Like all canids, the senses of smell and hearing are wonderfully developed in bat-eared foxes. A fox will pause, sniff, and turn its head and ridiculously large ears around before dashing off to gobble up termites, pick a caterpillar out of a bush, or even dig up a mouse hole. By turning their large ears about foxes hear even better in stereo (this is called binaural hearing) and can focus on their prey items. While the foxes’ ears and nose do help them locate insects, it doesn’t quite always give them the balance I expect. For example, on a particularly nippy winter night I observed one of our foxes, Bain, digging up ant nests. He picked around a bush, sniffing and swiveling his ears about before pouncing a bush and digging it up. A couple of times he dug too deeply for ants, and then fell head-first into the deep hole he had just dug. It was impossible not to laugh! During a follow a fox sometimes spends just as much time patrolling its territory as it does foraging, and possibly a fox uses smell to locate familiar places in their territory. Just as I use a torch to light up the night to make things familiar to me, fox urine is quite useful when marking over other fox pee or on termite foraging patches. Ilor, in particular, travels several kilometers during a follow. He will urinate on a random interesting spot after sniffing it, then another spot, and another, and so on. Occasionally foxes are known to wee on researchers boots or research equipment as well. This is how my field torchlight came to smell. I had set down my torch to feed Ben raisins, but Ben had other ideas. He came up to the torch, sniffed it, lifted his leg, and “pssst,” my torch now stank of battie pee. I still am not sure if I should be offended or happy that Ben claimed me as his own… I of course later sanitized my torch, but I still advise not smelling it too closely. 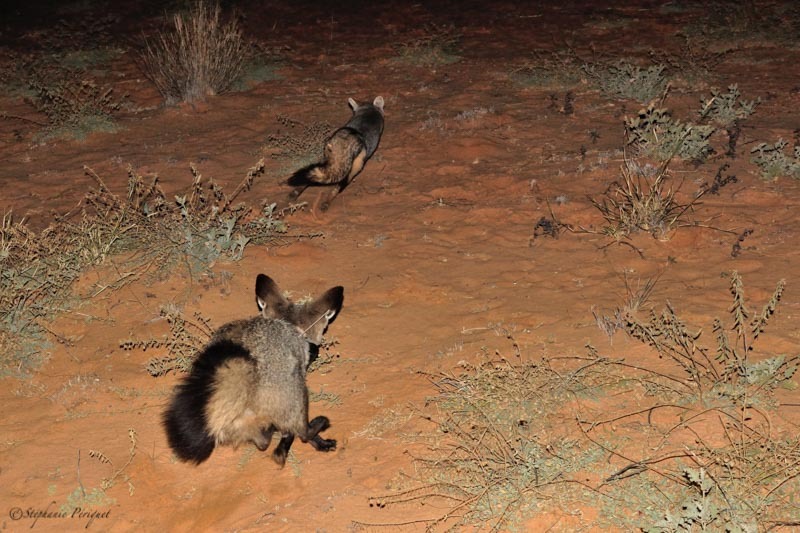 This entry was posted in bat-eared foxes, field biology, Kalahari and tagged bat-eared fox, batties, ecology, field biology, nocturnal, Otocyon on September 16, 2015 by elizabethkarslake. On a cold winter night, I was walking around Pharside Dam as I wanted to just check in on Escobar (one of our habituated males) in the area. After I called for about 5 minutes, he pitched up from behind a grassy patch and waited for some raisins. Happy that he was looking so good, I left Escobar around and started my search for Emmental, the other habituated male in this part of the reserve. We hadn’t seen Emmental for a while despite searching on a regular basis, so alarm bells were starting to ring. My steps took me on a big loop in the area, without much luck. As I was walking back on the road, I spotted eyes in the distance. I took my packet of raisins out and crinkled it, hoping this pair of eyes belonged to one of “our” foxes. It was indeed a habituated fox, but not a battie! It was Ray, the Cape fox (yes, they all come with name tags)! He came running at me for some raisins. With winter on us now, foxes are all super eager for this treat! I stayed with Ray for a while when Escobar found us again. Ray, the Cape fox, looking hopeful and apprehensive. I was getting rather excited and curious about how these two species will interact. 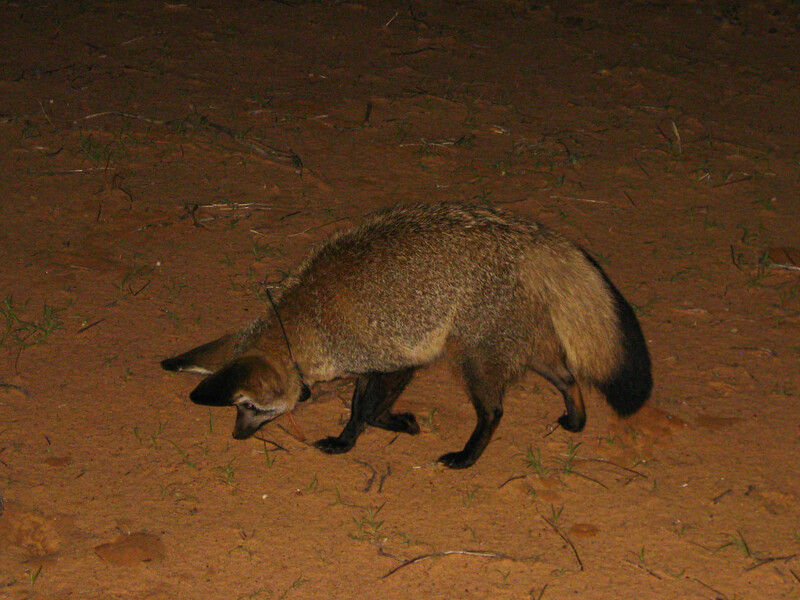 Batties are slightly bigger than Cape foxes, and from the few interactions we have witnessed, they seem to be dominant. As usual, Escobar chased Ray away immediately. Definitely, these raisins were his to eat! He had to stay on his toes though, as Ray kept hanging around, hoping for a lucky raisin, and it was only Escobar’s growling and puffed-up tail that stood between him and the juicy treat. But Pharside still had surprises in store for me that night, as another batty suddenly approached. To my delight it turned out to be Emmental! He was looking extremely healthy and robust compared to Escobar, so I was certain Escobar would now have to give up his stash. Escobar thought so too. He crouched down, growling, tail raised and puffed up, in a very submissive position. But within a fraction of a second, the tables were turned. Escobar jumped up and started a fierce fight with Emmental, eventually winning and chasing the bigger fox away. And for the next 30min, I was in the company of these three foxes. When Emmental finally started to drift away, I simply could not follow him, as both Ray and Escobar were on my heels! It was a very peculiar stand off, with both of them circling me whenever I paused for a second, and Ray trying to keep his distance form Escobar. I was impressed by Ray’s tenacity. 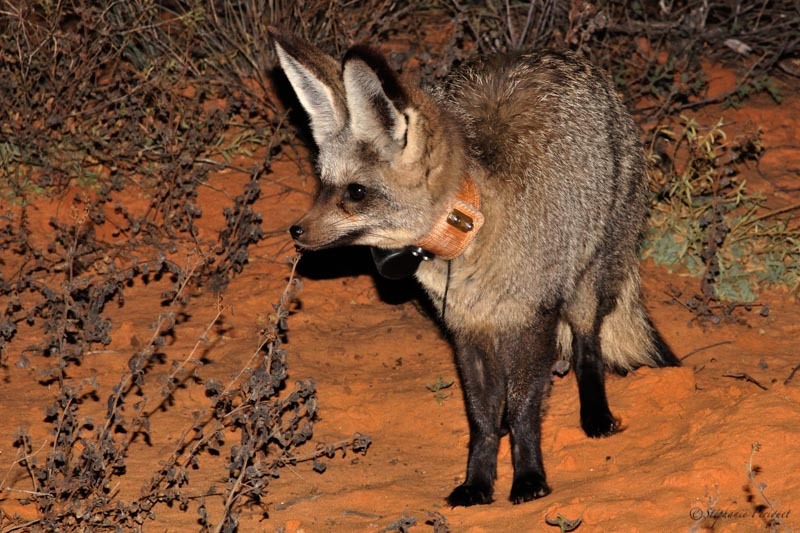 This entry was posted in bat-eared foxes, field biology, foxes, interspecific competition, Kalahari and tagged bat-eared fox, batties, batty, canids, competition, ecology, field biology, foxes, Kalahari, Postdoc on August 11, 2015 by Steph. After spending about 300 days in the field, I returned to civilisation enriched and ready to tackle the next challenge on my journey as a PhD student. I had learned new skills, habituated foxes and picked up a substantial amount of poop, but I was VERY happy to return to a place where I could drive down the road for a supersize BigMac with Fanta whenever the cravings hit. However, I realized again there is no rest for the wicked as I started my lab work. For endless weeks it was my fate to be drying faecal samples, pulverising dried pellets and finally extracting the hormones, getting used to a brand new routine (working by daylight, instead of starlight). Who knew that returning to Pretoria and doing lab work would isolate me more than being in the field? I would drift away into my own poop-filled world before the distinctive aroma of carnivore faeces shocked me back to reality. After a few monotonous weeks of solitary extractions, I was surprised to find a friend from Zurich visiting the lab for a few days. Through all the gossip catch-up and b(sh)anter we bounced ideas off each other before he made his long journey back home. I was alone again and focussed to get the job done as the end slowly crept closer. Before I could close the lab door behind me, I had to burn my samples to complete the process. Nothing prepared me for the smell of burning bat-eared fox poop at 450°C. Protection is essential in the lab. Maybe laundry pegs for the nose would also help? I am sure I was the most unpopular person in our entire building as the smell of smouldering organic matter overtook us all, filling the halls with a lingering odour. It was all worth it in the end when, after 14 months of sweat and stress, I was holding the newly extracted (non-smelly) hormones in my hand. As I carefully store all the tubes of extract, I realise that these little tubes will make up a substantial part of my PhD thesis (and future). I now have to wait a few more weeks before I get the final faecal samples from the field. 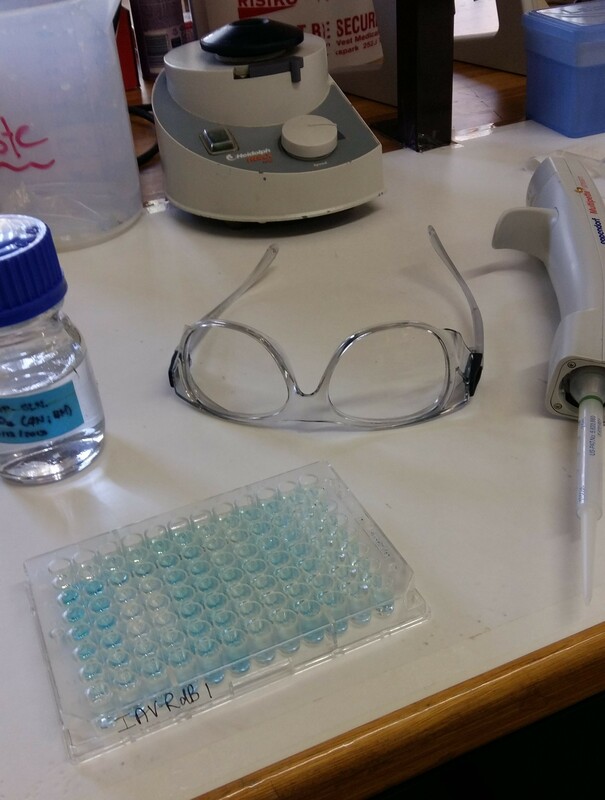 Once I’ve finished the preparatory lab work, I can finally start the analysis of my hormone samples. I miss the field; watching the sun set as I head out for the night and, sometimes, watching the sun rise after spending the entire night observing foxes. I thought I would return to civilization with a bronze glow; alas, I extensively worked on my moon tan and it seems I will continue doing so as I will spend all my time in the lab, until the end of my PhD. 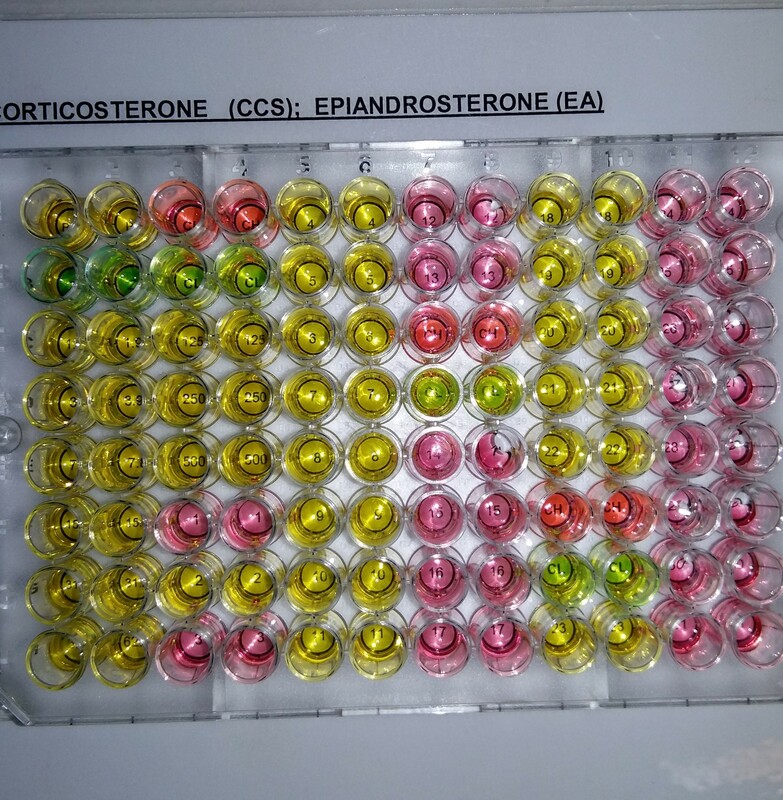 This entry was posted in bat-eared foxes, endocrinology, foxes, labwork, Otocyon and tagged bat-eared fox, batties, endocrinology, foxes, labwork, Otocyon, PhD on July 29, 2015 by Ruan de Bruin. Returning to the Kalahari to work on batties becomes a more daunting prospect when the research project is your own. There are considerations such as whether or not your experiments are feasible in the field and – importantly! – whether the foxes are going to co-operate. My idea was perhaps a tad complex… I designed a series of memory trials that required the foxes to investigate an experimental arena with a bunch of little boxes in which they had to dig no less than three times in the space of 2 hours. And, if they complied on night one, I needed to repeat the feat with the same foxes multiple times. Naturally, I was nervous. Fortunately, batties are very curious. To my relief, they’ve taken to the task at hand with alacrity and enthusiasm. And to my increasing amusement I am now witnessing the ways in which that enthusiasm manifests itself. For some, they are quite content to sit nearby watching me feverishly setting up the camera and arena, eager to dig up the raisins buried in the little boxes. The fact that they hang around at all is somewhat of a minor miracle – these are wild animals and they have an entire reserve to disappear off into should they so choose. The reactions of others has been a fascinating reflection of their very unique personalities. Our highly intelligent vixen Donna, for example, lacks the patience to ever actually complete a trial, choosing instead to trash the arena like a surly teenager before stalking off, growling, into the bush. Which is why I found it particularly frustrating that Donna, not content with merely making my life difficult when she was in the spotlight, decided she needed to gate-crash someone else’s trial as well. The fox in question, Bertha, is the mum of our current batch of pups and — despite her efforts at finding “me-time” — a difficult subject to get on her own. Two of the pups (lets call them Bane and Pestilence), have made it their personal mission to interfere as much as possible with the serious business of science. They excel at… er… endearing things like untying my shoelaces as I’m manning the camera, or rummaging through my rucksack in the middle of a trial when I can’t stop to move it. Thus, having accomplished the difficult task of getting Bertha on her own for a trial, the last thing I wanted to see midway through trial 1 was Donna. Donna’s approach was marked by a sudden business-like growl from Bertha. Now, in the past, Bertha has always been submissive to Donna, but with the arena in front of her she wasn’t having any of it. She growled meaningfully in Donna’s direction and stood her ground, one paw possessively placed in a box. Donna, being who she is, couldn’t stomach this affront and came striding towards us, intent on her mission of sabotage. Seeing that she was about to start a fight, I moved to a spot in between her and the arena to block her passage, sporting my best Gandalf-like “You shall not pass” face. Realising that neither myself nor Bertha was going to allow her access to the arena, Donna gave the only respectable response that a highly-strung vixen could give in this sticky situation. She screamed. She literally sat down, a couple of meters from my foot, and yowled at a pitch that predicted perforated eardrums before the night was through. Now, I know this sounds like a bizarrely traumatised reaction, and I could be accused of meddling unethically with our wild animals’ emotional well-being. However, screaming is a form of self-expression peculiar to Donna. I know this, because she also does it if she happens to be around when one of the pups is getting attention from us, or if you simply aren’t paying enough attention to her directly, or whatever other slight to her person, real or imagined, is underway. I chose to ignore her (and deal with my eardrums later). Bertha too, after casting the other vixen a bemused glance, seemed happy to disregard her wailing, so I resumed filming with Bertha enthusiastically digging for raisins. 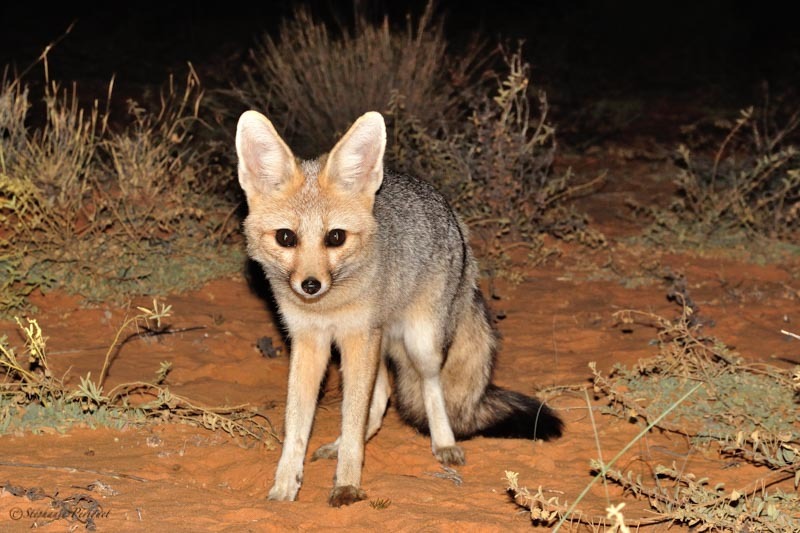 This entry was posted in bat-eared foxes, Cognitive ecology, field biology, foxes, Kalahari, Sam Renda, Uncategorized on May 30, 2015 by samantharenda. This is it, the end of my first week in the field in the Kuruman River Reserve working as a post-doc on bat eared foxes. And I must say, it was filled with first times. To start with, despite having work in the African bush for nearly 6 years, it was the first time ever that I went out wondering on my own at night armed only with… a torch and a packet of raisins! Coming from lions and hyaenas country (and actually many more dangerous animals, I used to work in Hwange National Park in Zimbabwe), I must say it’s quite unsettling… I had to refrain from freaking out whenever I heard a noise and to convince myself that no, every pair of shining eyes I see in the beam of my spotlight is NOT something that will try to eat me or charge me! 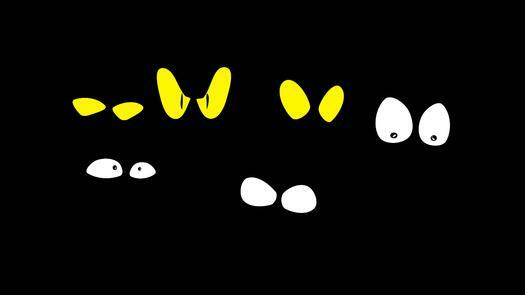 Who knows what lurks behind each set of eyes? The good thing is, you tend to relax quite quickly and rather enjoy the silence of the night with only the stars watching over you. The “bad” thing is, you also have to stay focused because you are still in the middle of the bush. There are snakes, dangerously large holes dug out by springhares and aardvarks, and the possibility of encountering scorpions or spiny mammals (you don’t want to surprise a porcupine at night!). Now, I was talking of several firsts: here is the second one. This was my first time baby-sitting a drugged fox! As part of my work here, I have to remove radio collars from our dear batties. They are several ways to do that. Because these foxes are habituated, they come quite close to us, especially when we give them raisins! So our first plan was to lure the female Donna in a cage with raisins. It worked quite well, but we found that she fought pretty hard in the cage and I struggled to handle her from there. It’s amazing how strong these little creatures are! So for the second capture, we decided to give Ilor some sedative to lure him easily in the cage and to keep him calm. It worked perfectly. We removed the collar easily and he barely moved during the operation. We then let him sleep it off back in the cage…And there I was, sitting next to the cage for the next 2 hours, baby-sitting this cute little drugged fox. After 2 h, he seemed quite alert, and it was time for him to be set free. But he simply wouldn’t exit the trap! I had to lure him outside with some more raisins! It was half an hour before Ilor seemed satisfied that I won’t be offering more treats, and he finally wandered off in the Kalahari night, free of his collar and apparently oblivious to what just happened to him. And here come the third first: my first aardwolf in the wild! Aardwolves (Proteles cristata) are from the hyaena family but they only eat termites and other insects. They are also quite small with black stripes on a grey coat and can erect their mane and tail to appear bigger when threatened. Anyway, I spotted him (maybe her?) in the beam of my torch and managed to get close to the rather relaxed animal. What a beautiful creature! I followed the aardwolf while he foraged for termites, and he eventually led me straight to one of our habituated fox! These two species must use the same areas as they both eat termites and there might be some sort of competition between them? Questions started racing through my mind – the possibilities seem endless — and I can’t believe this rich desert is now really my office! My postdoc is certainly off to running, happily drugged start. 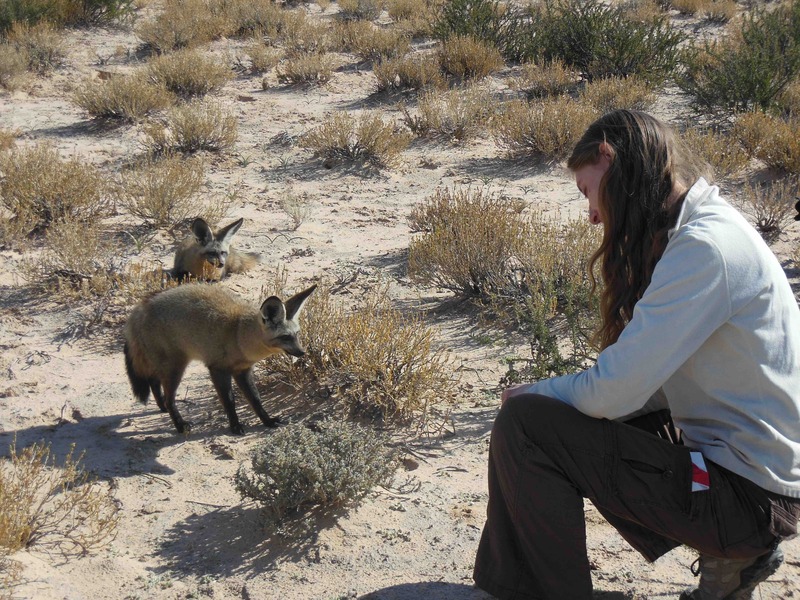 This entry was posted in bat-eared foxes, field work, Kalahari and tagged aardwolf, bat-eared fox, canids, field biology, Kalahari, Otocyon, Postdoc on May 15, 2015 by Steph. The start of a PhD poses many challenges, and I am sure I am not alone in the fears I have… will I be able to collect enough data in time? Will I be able to answer exciting new questions? But the embarrassing fear I didn’t even consider until a few weeks before embarking on this adventure is my fear of the dark. For my first week in the field I was pleased to learn I would accompany Keafon and Sam at night for training, so my dreaded solo trip was postponed. However, even then I began to wonder how I would ever feel comfortable with the eeriness of the dark, where strange shapes can appear and unknown noises play with your mind. My only protector in the dark Kalahari nights. One week later it was time for my first solo outing. As I set out in the dark my heart was racing, but I kept telling myself, you can do this! Just for a moment, I turned my spotlight off and embraced the darkness. It was an overcast night and the blackness engulfed everything. But turning the light on and off as I pleased meant I was in control of the dark… But last night was different. Following Ernie at high speed kept me more than occupied and the thought of the dark didn’t even enter my mind, when suddenly, my torch batteries failed. After a few deep breaths I reached into my bag and felt around for new batteries. I slowly placed them into the torch, breathing a sigh of relief in anticipation of fresh, bright light. After a small pause, I click the torch on and……nothing…….darkness. Not a problem, still another four newly charged batteries to go. Again, reaching into the bag I found the batteries and carefully placed them into the torch, but still…darkness. I could feel my heart thumping in my chest, and I wondered how long I should leave it before calling for help. All that kept running through my mind were the stories Keafon and Sam had told me about snakes. I had horrid visions of being surrounded by masses of snakes. After 15 minutes of sitting alone in the dark, desperately trying to get my torch to work, I decided it was time to call Keafon. As the car’s headlights appeared on the horizon I breathed a huge sigh of relief. My time in the dark was over. Luckily, after only 10 days in the field, I am in love! The foxes and their individual characters are simply amazing and this adventure with them is going to make any fear easy to overcome and most certainly worth the bumpy ride of facing those fears head-on. This morning, as I sit here and reflect on my experience I am pleased my batteries failed; it forced me to face my fear and realize the dark isn’t so bad… and the feeling of being the only person left in the world is pretty amazing. I imagine there are not many places left in this world where one can have that feeling! 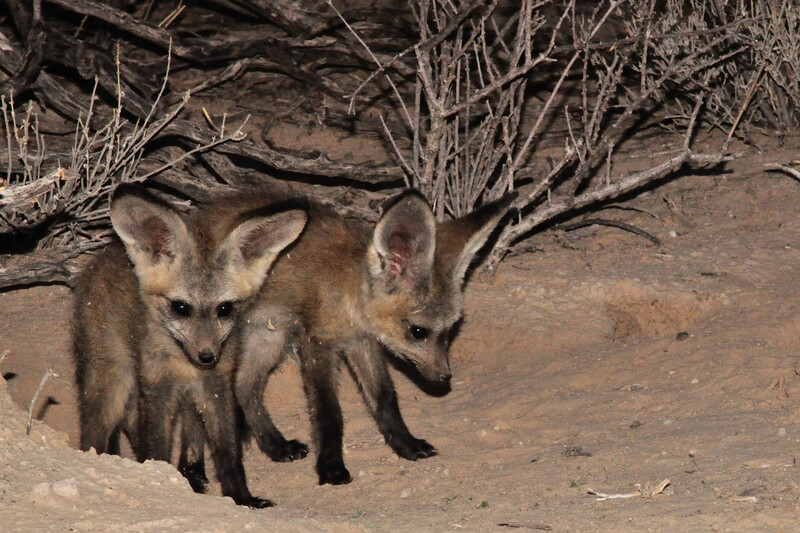 This entry was posted in bat-eared foxes, field biology, field work, Kalahari and tagged bat-eared fox, field biology, Kalahari, Otocyon on March 17, 2015 by welchrebecca83.